Since I played pretty much every game they offer, I decided to compile a Jetwin casino review of my own. This crypto-only casino captured my attention with its rich and diverse games library, which had me coming back for more over and over again. The website stands out with its powerful platform, which—although a bit simplistic—takes gaming to a whole new level when it comes to stability and speed. However, what makes it stand out among other Bitcoin casinos is the helpful, professional, and ever-present customer support. It’s always there to answer all your needs. If betting is more your thing, you can always try the Jetwin sportsbook with loads and loads of available sports and events. However, Jetwin has so much more to offer, so let’s take a few minutes together and see what they have in store for new customers. Jetwin came about in 2013. Needless to say, the team behind it has had enough time to hone their skills and offer customers a prime casino experience. The website has a wholesome assortment of all kinds of betting activities. Apart from the Bitcoin casino, you can also test your luck in the live casino and Jetwin sports betting section. The team behind the website claims that Jetwin is the most trusted Bitcoin casino in the US. In the next couple of pages I’ll try to show whether that’s true or not, but before that, let’s see some quick pros and cons. Whenever you wish to start your gambling adventure at Jetwin casino, all you need to do is hit the big red Join Now button in the top right corner. At that point, a pop up will appear before you where you will have to enter your email, desired username, and password, along with the display currency. Be mindful, though, the display currency is not the same as the accepted currencies for deposits. What this means is that the website will translate your currency into the currency of your country so you can keep track of your expenditures more easily. Note that the same account is used both for Jetwin sports and the casino. The displayed currencies available are US, Australian, Singaporean, and Canadian dollars, as well as euros, British pounds, Russian rubles, Swedish kronor, Turkish lira, and Polish zloty. When you’re finished with the account creation, the site will automatically send you a confirmation email with a verification link in it. Once you click on the verification link in the email, you’ll find yourself on their website again. Just log in with your credentials, and the fun can start. The most notable characteristic I noticed while writing my Jetwin casino review was the quality of their platform. Right from the homepage, you can see that a great deal of care went into creating and polishing the website. All the buttons are clearly visible, and the loading times are pretty fast. On average, a game takes less than 10 seconds of loading time. The games section is where Jetwin really shines. The website has around 900 slots, most of them provided by Bet-Soft and eGaming. Next, there’s the table games section with 19 available games, including different variations of poker, baccarat, blackjack, craps, pai gow, pontoon, rummy, and red dog. The roulette section at Jetwin casino contains 41 different versions of roulette, including but not limited to American, Classic, and French roulette. The video poker section provides the biggest assortment of games. There are 97 of them, and pretty much any variant of poker you can think of is there. Then, there’s the scratch section with 10 different games. In the end, the Others section contains various games that don’t fit anywhere else: bingo, keno, virtual racebooks, and a Wheel of Luck. You can find a lot of reviews online making comparisons with other Bitcoin casinos, like Jetwin vs Cloudbet, but when it comes to games variety and quality, Jetwin definitely wins. Although there is no official Jetwin mobile app, you can still play their games on-the-go. I’ve tested their mobile website on both iOS and Android devices, and they run without any problems. In fact, the mobile site is quite similar to the website itself when it comes to quality and loading times. The website accepts Bitcoin, Bitcoin Cash, and Dash. The deposit time is short—ten minutes—but when it comes to withdrawals, you may have to wait around one hour and twenty minutes. Jetwin withdrawal limits are very low—the minimum amount you can withdraw is $2—while there is no minimum deposit amount. Since this is a Bitcoin casino, you can play it from anywhere around the world, i.e. wherever Bitcoin gambling is legal. The website doesn’t impose any restrictions on its players. As for supported languages, Jetwin comes in English, French, and Turkish. When it comes to bonuses and promotions, Jetwin falls short. The website doesn’t have any promos for casino players whatsoever. Customers are greeted with a Jetwin no deposit bonus right from the homepage. The team claims that every player receives a $65 no deposit bonus when they make an account. However, when I visited the promo page in hopes of claiming my bonus, I was sad to find out that the no deposit welcome bonus was discontinued. It’s a shame, too, because the bonus would be quite useful when beginning one’s journey on their website. The website lacks any other casino bonuses, which is quite odd for a Bitcoin casino that has so many years of experience under its belt. However, new sportsbook fans can claim a Jetwin bonus Free bet everyday. All you need to do is place single bet or multi-bets with stakes 2.50 or higher, and the website will grant you free bets. The promo starts every day at 08:00 UTC and lasts until the next day at 07:59 UTC. Note that the value of these Freebets differs depending on how many bets you place. 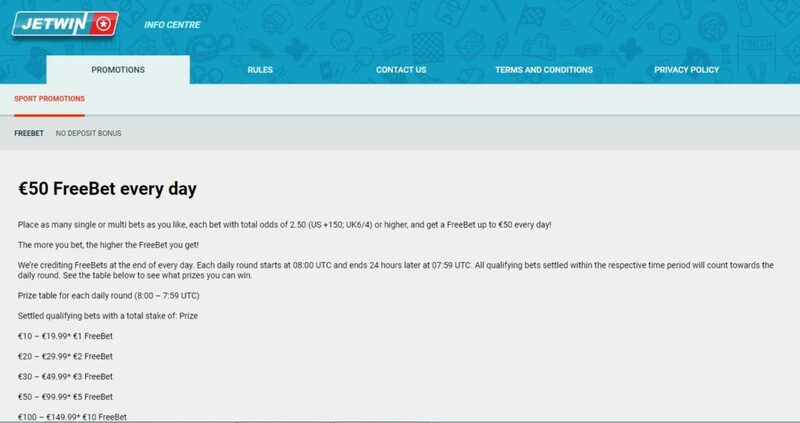 If your bet can earn you a €10 prize, you will get €1 worth of Freebets. The Freebets all go up to €50 for bets that can garner you €500. The best part is, Jetwin has no bonus rollover rule. This means you can spend your Freebet however you wish and claim your reward afterward. The only requirement is that you have to use it within the next 24 hours or your Freebet expires. Note that voided bets do not count and that you can’t place a Freebet and expect more Freebets as a reward. Although the website doesn’t have any casino promos, this betting bonus more than makes up for it since this is the only website that doesn’t require any rollover. Another highlight in my Jetwin casino review definitely has to be their ever-present customer support. While playing there, there were some things that were left vague, so I decided to contact their customer support team in order to get a better understanding of the issues at hand. Although the support team can only be reached through email, they are actually very fast in responding. The team replied in less than five minutes, and they always managed to clear any doubts I had. Apart from the high level of anonymity, the website also boasts a high level of security: all your transactions are anonymous and protected by blockchain encryption. At the end of my Jetwin casino review, I have to say that although the bonus section is quite poor, everything else shines when compared to other websites. They have a wide variety of games, a stable and powerful platform, and their customer support will solve any problems in a matter of minutes.